We had an interview with Philippe Mesotten, from Not A Company, about their upcoming game. A short bio: Philippe is the founder of Not A Company, where he’s currently working on the lootcrate-free Hoverloop. He previously worked as a VFX Artist on Divinity Original Sin: Enhanced Edition, LEGO Marvel Avengers & LEGO Dimensions. When did the concept for Hoverloop first come to you? Which games inspired you? Not having enough free time to game as a full time employee, I tried to fully enjoy every minute I actually could play games. As I didn’t have a lot of available time, I did not want to waste it on lengthy tutorials and learning how to play complicated games for hours on hours. That’s when I was introduced to Rocket League: a game that got me hooked from the start! But when they announced Halo 5 was going to ditch splitscreen play… Imagine my disappointment! 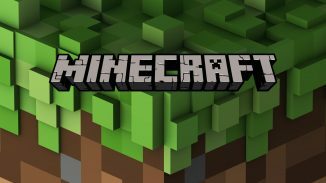 Made me long to create my own game that was easy to get into (but hard to master) and that you could play with your friends, on- or offline. After some long brainstorm sessions and a large (but safe) amount of Belgian beer, Hoverloop was born! Writer’s Note: I’m likeminded and would love to see this make a return. How do you hope to stand out from the pack? More and more games are added to the e-stores each day and it’s becoming increasingly difficult to get noticed. We are going to major conventions like Gamescom (Germany), IndieGarden (France) and GameForce (Belgium) so people can get their hands on the game even if it’s still in development. We also welcome YouTubers and Streamers to give us a shout, so we can give them a free key. By going to these big conventions we got picked up by the biggest Belgian news channel, VTM. They did an interview with us for the evening news, which was amazing! As you might imagine, we also try to get the word out through articles, like the one you’re reading right now! Because we want to establish Hoverloop as a social game, we also took part in a big Belgian funding campaign for charity: “De Warmste Week”. Writer’s Note: Hoverloop was auctioned through my initiative: De Warmste Gamer and was sold for €100! All profits went to Make A Wish. We’ll also be giving away 10 keys soon: 5 winners will each get 2 copies of the game so they can play with friends! Keep an eye on my Twitter account. How big is your team? Did you need to outsource a lot of jobs? We are a proud fulltime 2-man team! Because multiplayer games can be extremely daunting to create, we hired a freelancer to manage the online part of the game. We made sure to tell him to create a secret -GodMode- button that only we can use for online play! We hope to generate additional income from the Steam Early Access launch, to keep on the lights and the coffee machine obviously, because gamedevs run on coffee… Common knowledge! Writer’s Note: If you want to help; be sure to wishlist the game on Steam! 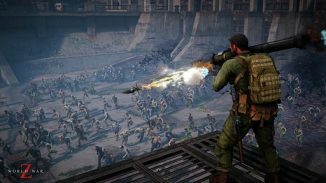 It will come to Early Access 29th of January. Do you have an idea about your asking price? Obviously we will not be asking the same price AAA-Studios ask for their games. The first week of Early Access we will be giving a BIG discount as thanks for early adopters, after that we’ll keep another deal live for some time where the price will still be lower than the eventual full launch price. The full launch price will be in the range of €15-€20. Since your game has skins etc, would you consider adding DLC: purchaseable skins, weapons, tracks… ? “I think micro-transactions have been going through a long evolution, starting off with tiny DLC packs. For instance the extra multiplayer-map pack for Halo 2. (what a game that was!) This recent Battlefront II business is a wake-up call that we have to stop that evolution, who knows how far it can go if that doesn’t happen. In the end we might have to buy each level of a game, and we get 10% discount if we buy them all together! To summarize: we are very much against the concept of gameplay hidden behind DLC, but we are open to cosmetic microtransactions. I think that’s a good way to gain extra revenue while keeping players happy. Providing an equal gameplay experience for everyone is paramount, in my opinion. Since cosmetic unlockables only add to a look and do not give any gameplay advantages, I see no problems there. Do you plan to keep supporting the game and adding new (free) content or would you prefer to move on to a new project once Hoverloop is released? We would very much like to keep development rolling after Hoverloop’s full launch. Adding new characters/customisables and levels to play – for free! We might add some microtransactions later on, but they’d be cosmetic only! If Xbox offered us the chance to get on to the Games with Gold program, we would jump on the opportunity, at warp speed! Online games very much support on their active player base, so that would create a MAJOR boost. 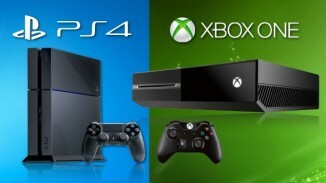 Will there be cross play between Xbox One and PC/Steam gamers? What are your opinions about the feature? 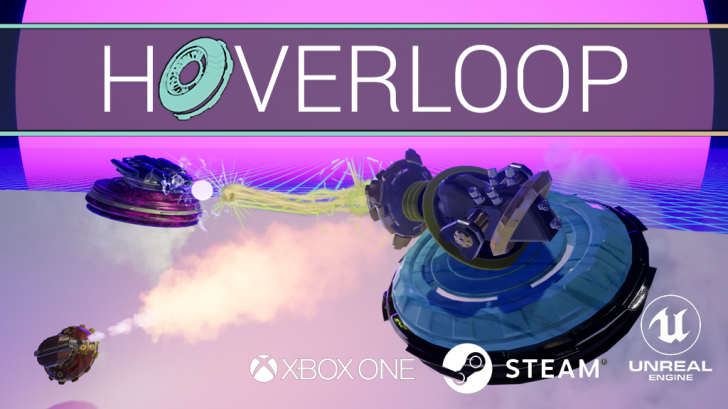 Since we will be developing Hoverloop for Xbox One as well, that would be a great addition. That said, we first need to nail down the perfect build for PC and Xbox One individually. Can you tell me some more about the different game modes? Which is your favourite? I personally think the air hockey one could be a hit. We have well known game modes like Deathmatch or Capture the Flag, but we also have more sporty ones like Air Hockey (Loved by many!) and Obstacle. Obstacle is a game mode where you’ll have to push a ball through multiple checkpoints, on a linear track full of obstacles. If that’s not hard enough, you will have to compete against 3 other players, and there is only 1 ball for the 4 of you! The player that pushes the ball through the most checkpoints, wins the game. For me, the game mode I enjoy most, is Invasion. Here you will have to team up with your fellow players to defeat endless waves of enemy drones. All these game modes are designed to be played in short matches, 3-10 minutes maximum. 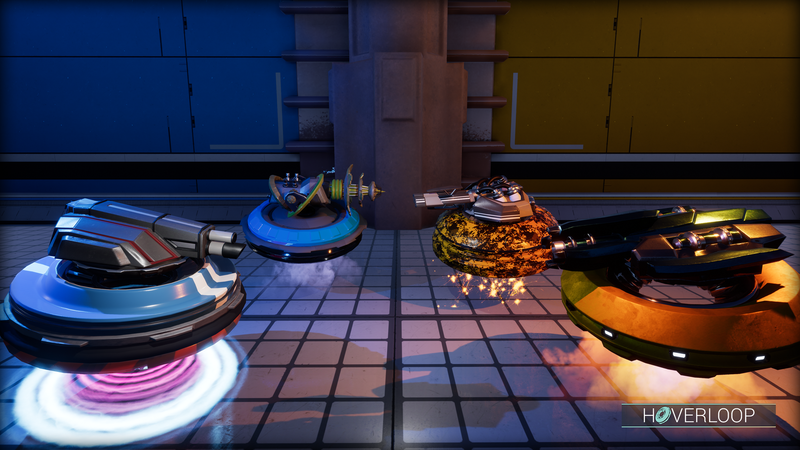 So you could say Hoverloop is a party game, to be enjoyed by everyone. And since the violence is limited to robot on robot; it’s child-friendly to boot! Well, I hope you’ve enjoyed this talk with Philippe. 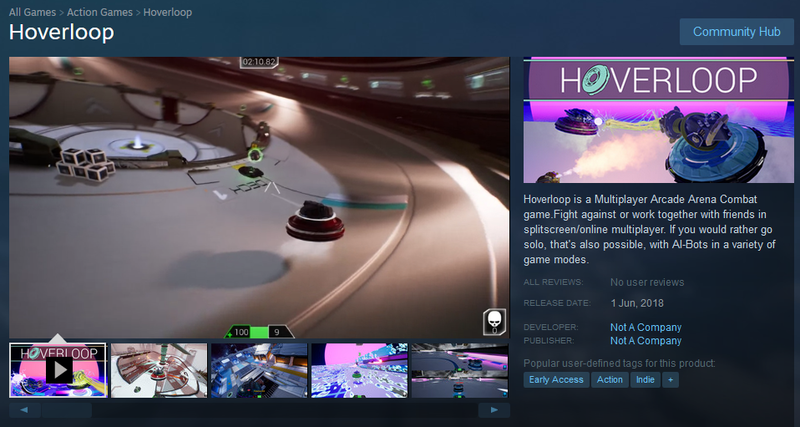 Hoverloop will go into early access on the 29th of January, so don’t forget to wishlist the game on Steam.